Any telescope can have its focal length increased (for more magnification) by using a Barlow lens or reduced (to increase field of view) by a focal reducer or positive lens. There are practical limits to this. Focal reducers are frequently used with small sensor cameras to increase their field of view. With a larger sensor, vignetting or loss of focus due to field curvature may limit the focal reducer's usefulness. The images below explore the limits of reducing focal length in the Questar with a large sensor camera. Jim Reichert of Questar told me that their 3.5" telescope was designed for an 18mm circle of full illumination. My experience shows a flat field and better than 90% of center of field illumination within this radius. 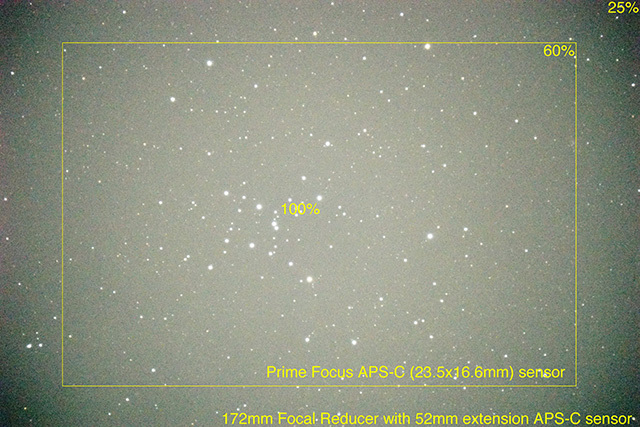 At prime focus this is a nice match with an APS-C sensor which is a bit less than 24x16mm. 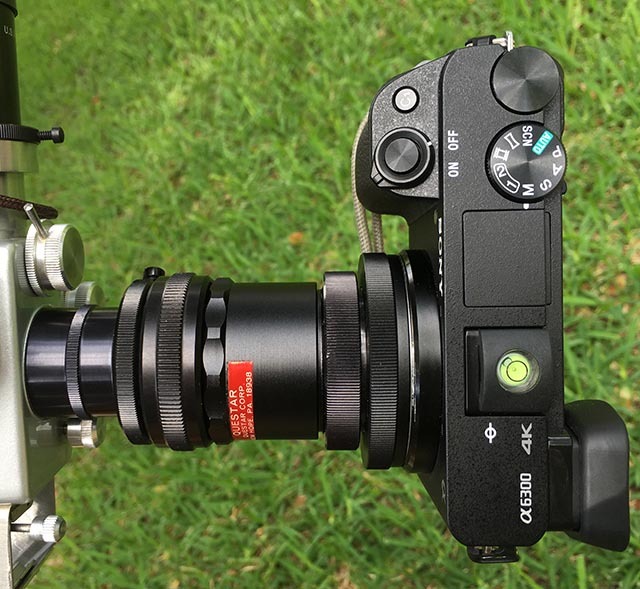 Questars are often used with full frame (36x24mm) cameras, so there is useful light well beyond a circle of 18mm. An APS-C sensor camera has a field of view of approximately 0.9 x 0.6 degrees at prime focus. This is enough to capture the sun (apparent diameter of about 0.5 degree), but not much more in the short dimension. A focal reduction of about 1.3 x will allow a field of view of about 1.2 x 0.8 degrees with a APS-C sensor, almost double the prime focus image area. This FOV allows single exposure captures of the Pleiades or more of the solar corona in an eclipse. I decided to test the Questar 172mm achromatic positive lens designed to give up to a 0.7x focal reduction. My testing found that the illumination along the far corners of the APS-C sensor at prime focus was about 60%. With the focal reducer (and by extension a full frame sensor at prime focus) the illumination in the far corners was 20% or less. Loss of field flatness at the edges also makes focusing very critical with some softness of focus at the edges of the image. How useful this is to you depends on your target. If you are capturing field stars for context in a DSO that is contained in the center of the image, then using the APS-C sensor with a focal reducer or full frame image should be fine with flat frame correction. If you want to capture faint nebulosity or solar corona details up to the edge of the frame you will probably be disappointed. In terms of field of view, the highest quality Questar images are limited to about a 3/4 degree FOV. With a focal reducer or full frame sensor you can push this to 1.3 degrees or so, but sensitivity and flatness of field are compromised. With smaller sensors the focal reducers will be much more useful. 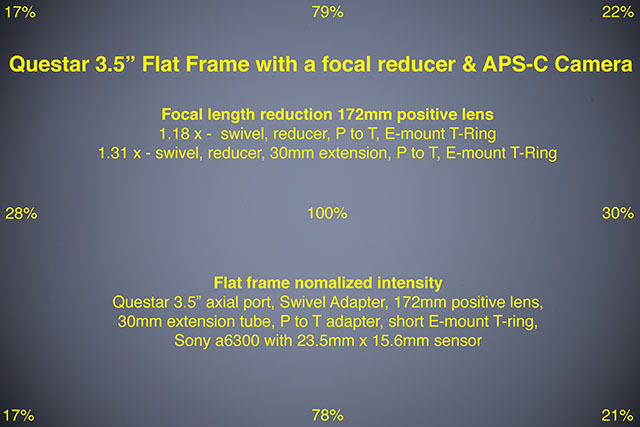 The images below illustrate the performance of the Questar 172mm positive lens with an APS-C camera. Vignetting is significant in the corners. A more powerful focal reducer or a full frame sensor with this reducer will be of little practical benefit. A flat frame with focal reducer and luminosity measurements at the center, edges, and corners. Next is a composite photo of the Moon at sharp focus in the center of the frame with the 30mm extension tube. Without changing the focus I repositioned my aim with the Moon at the extreme ends of the frame. As you can see the focus is soft at the far sides. With a more balanced focus it may be possible to improve overall focus. 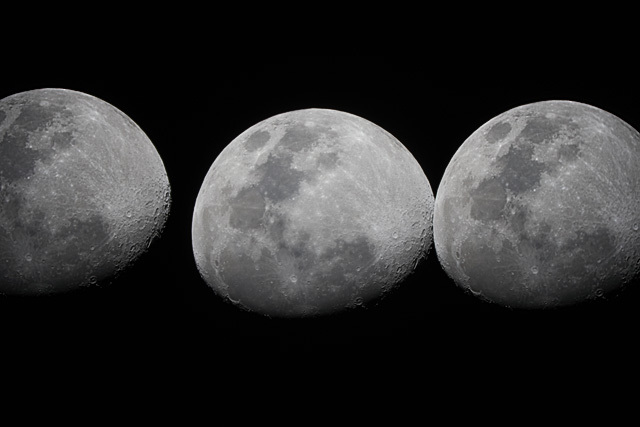 Composite of three Moon images focused only once for the Moon in the center of the image. M7, the Ptolemy Cluster, makes a nice size target to see the effects of the focal reducer in both field of view and vignetting due to the Questar's baffles. The image was made with the 172mm focal reducer and about 52mm of extensions (30mm extension tube and 22mm of adapters to the E-mount camera flange). With the focal reducer, the APS-C sensor captures about the same field of view as a full frame sensor. There is significant vignetting in the corners. Measurements of the sky glow background are in rough agreement with the flat frame measurements above. Changing the distance between the focal reducer and the sensor allows the amount of focal reduction to be adjusted. The daylight images show the same scene at prime focus and with the focal reducer at two different distances from the camera sensor. 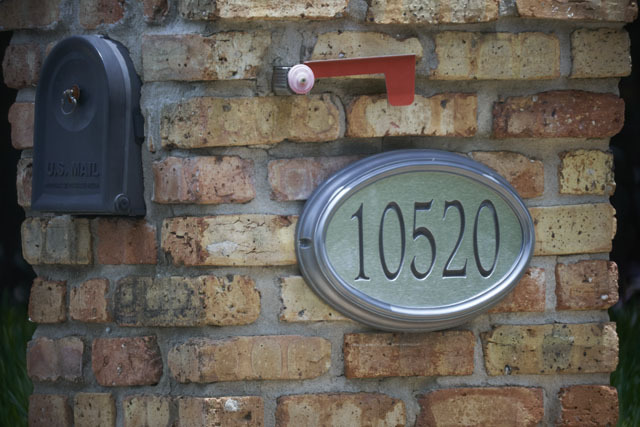 My neighbors mailbox at prime focus. 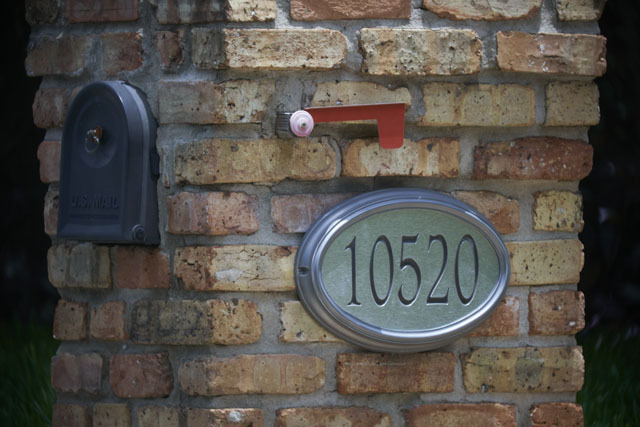 My neighbors mailbox with the 172mm focal reducer inserted after the swivel adapter. The E-mount adapter adds about 22mm between the focal reducer and camera lens mount flange. 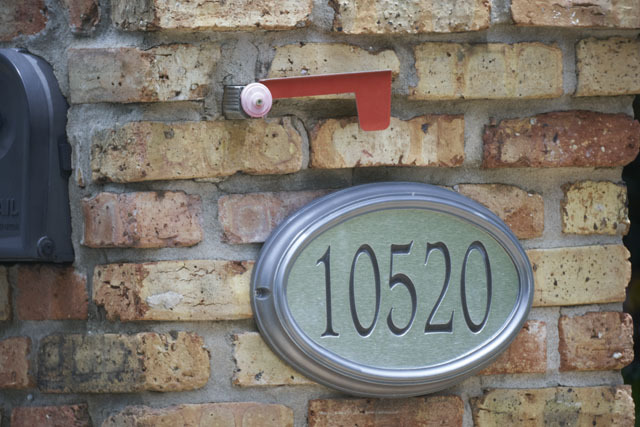 My neighbors mailbox with the 172mm focal reducer and 30mm extension tube inserted after the swivel adapter. The adapter train with the swivel, 172mm focal reducer, 30 mm extension tube (red label), P to T adapter, T-ring, and camera.